Applicable to all 126 sedans and coupes from 1981 to 1991. This includes the 380SE 380SEL 380SEC 300SD 500SEL 500SEC 300SDL 420SEL 560SEL 300SE 300SEL and 350SD.Front and rear suspension overhaul is almost always left until one has fixed everything else on the car. We know that most owners can live with some looseness in the suspension, especially when you consider the age of the 126 chassis. But if you want to restore that great Mercedes factory feel and ride (that we all love!) 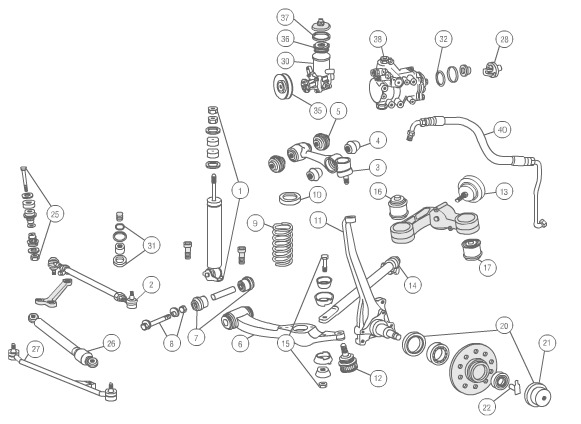 there is no short cut but to replace all the rubber and metal wear parts in your front suspension. Here is an example. Pictured is the most common problem we see on 126 fronts end. When the support rod ball joint wears out ( see # 13 below ) you will experience front end clunking noises when driving over rough ground or when breaking to a stop. Left and right lower ball joints (same part 2 required) #12 Common Symtoms: High pitched squeal when turning. Need a complete Kit? Save $$$!